Best time is in the morning when it is not too hot. 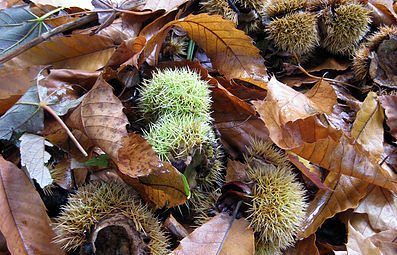 Chestnuts fall to the ground once they are ripe. The outer protective layer (the burr) is like a prickly tennis ball. This is why you need thick gloves. This usually splits apart when it lands on the ground. If not, use your feet to break them first. Choose the shiny ones which have no air between the nut and the shell. They should be hard to press. Discard any with worm holes or other signs of damage. Have a rest and picnic while you are there. Roast them for 20 minutes in 180c.